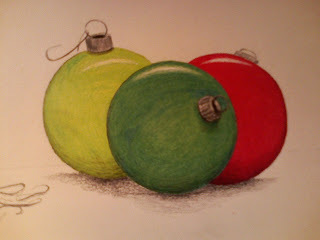 I am enjoying the sketching this Christmas season. I am having visions of things I could sketch, still have several I would like to do. Cake...of course, like to bake (and eat) them. Like visions of sugarplums dancing in my head....except - it's not. I don't even know what a sugarplum looks like. Believe me, I need no more confusion going on inside my head! Yeah, what of it, I'm blonde, but it isn't all natural these days. This was created with colored pencils. Those baubles are so wonderful. I'm so jealous, wish i could get that lovely effect. love the colors you chose for your painting!